Trees dominate the woodland and forest communities in which they grow but hosts of other organisms - including fungi and bacteria - which evolved in parallel with them, live beside, beneath and in them in an interacting whole. The types of animals involved in such communities are illustrated in Fig. 1.8; in many other parts of the world the major differences from western European forests involve the presence of much larger herbivores and carnivores and of primates such as monkeys and gorillas. The very many thousands of different organisms found in woodlands and forests would be quite unable to exist apart from their non-living (abiotic) surroundings, and it was in recognition of this that Tansley (1935) first used the term ecosystem in print. This is a level of organization that integrates the living and non-living components of communities and their environments into a functional whole. The term ecosystem was in fact suggested to Tansley by Clapham, then a young man in the Department of Botany at Oxford, in the early 1930s, and was used by Tansley without acknowledgement. This is made clear by Willis (1997), who treats the ecosystem as an evolving concept viewed historically. Ecosystems require an almost constant flow of energy if their living communities are to survive; nutrients are simultaneously cycled round them as Fig. 1.9 demonstrates. Vulpes vulpes Mustdti erminea Putcrius putorius Fetis domesticas Sus scrofa Ctrvus ilrphas Dama dama Capreolus capreolus Metes mete i Erínaceus europaeus Pipistreítus spp. Aiyetalus nítctula Sdurus vulgarií Lepas títptnsis feuropaeus) Talpa europaea Sorex spp. Cíeithríonomys spp. Arvícola spp. Jyfvaewiiíi spp. ■' Oniy I hi main groups are listed. Very lar^e numbers ol ipeeies and oE individual? fmm certain groups are present. 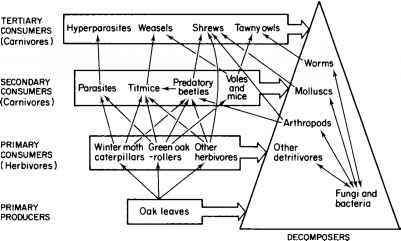 They are noi shown on ihe diagram but, broadly, spiders and certain insect ¿roups are arboreal, while most of [he rest occur on the ground or in ihe soil. In particular, many spedes of Insects are preseni, filling many different rolcsr Often ihcir larvae Iced in very diflerent ways from ihe adults. Or microscopic: C. mainly carnivorous; O, omnivorous; Hh herbivorous; D, dctritivorous; X, parasites on animals: V, parasites on plams. transfers through the woodland ecosystem using a systems approach concentrating on larger subsystems. The plant subsystem is made up of all the green plants (the primary producers or photoautotrophs). They use photosynthesis to convert carbon dioxide and water into sugars and starch, which are used to grow new leaves and wood, and fund reproduction with some stored for the future. The total amount of material they create is referred to as the gross primary production. Not all of that is available to herbivores, however, because a significant proportion (typically 90%) is used in respiration (the running costs of keeping the plants alive). The overall amount of carbon fixed after respiratory costs is referred to as net primary production (see Chapter 3). In wooded areas, the amount varies from around 5tha_1 in the northern coniferous forests to 25tha_1 in tropical rain forest. Plant net production is potentially available to the hetero-trophs of the herbivore and decomposition subsystems, which are unable to make their own food by photosynthesis or chemosynthesis as autotrophs do. The herbivore/carnivore subsystem consists of all consumers feeding on the plants or each other. 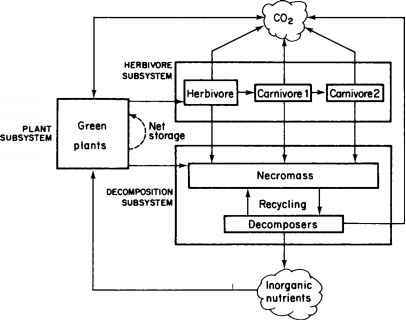 This encompasses herbivores (primary consumers) feeding directly on the plant subsystem (leaves, flowers, wood, etc. ), including bacteria and fungi, and the carnivores (secondary and tertiary consumers) that feed on the herbivores and each other (see Fig. 1.8). As before, up to 90% of the energy eaten is used up in respiration (usually more in herbivores than carnivores because their food is harder to digest and their activity is more constant - Section 8.2), leaving just 10% at most to be passed on between subsystems. The number of levels that can be sustained is obviously at least partly determined by the amount of energy available to be passed from level to level. And by necessity each successive level of consumers must be of a smaller overall mass. This explains why a forest contains very few big cats compared with the number of herbivorous deer. It should also be noted that different organisms within the subsystem can fit into different levels of consumer; for example, the omnivorous black bear of North American forests is a herbivore feeding on berries and roots but is also carnivorous, as foresters are well aware! Collembola and ants); and the macrobiota (>10 mm - millipedes, centipedes, snails, earthworms and large insects such as beetles and termites). They utilize all the dead components of the woodland: dead plant material and wood, dead bodies and all the faeces produced by the living. Dead material may be cycled several times through this subsystem before it is gone. Beetles, for example, chew on dead wood extracting some energy and nutrients, and their faeces in turn are reworked by other sets of organisms, extracting more energy and nutrition, and so on. Generally the larger organisms physically break down or comminute material suitable for the smaller organisms. Eventually all that is left are some of the more inert remains which form the black humus of the soil and which may persist for millennia (referred to by Ashman and Puri (2002) as something like a chemical 'junk yard'!). As decomposition proceeds, all the contained energy is lost in respiration but the nutrients are released in an inorganic (mineralized) state, available to the plant subsystem, ready to start the cycle again. It is interesting to observe the activities and distribution of particular groups of detritivores (a term used here in the wide sense to describe decomposer animals that exist primarily on fungi or bacteria, as well as those which ingest the dead material known as necromass - see Section 7.5.2) such as the mites. Wallwork (1983) gives an account of oribatid mites in forest ecosystems, while Anderson (1971, 1975) describes both their vertical distribution in two woodland soils and their role in decomposing leaf litter. His examination of the gut contents of many individuals of these microarthropods enabled him to place various species of oribatid around the margins of a triangle whose corners represented 100% fungal material, 100% amorphous material and 100% higher plant material. Packham et al. (1992), who describe the decomposition of wood, leaves and other substrates, as well as the experimental use of cellophane, also give an account of succession amongst detritivores. Though both are many-legged arthropods, the carnivorous centipedes (Class Chilopoda) have one pair of legs per segment, while the essentially vegetarian millipedes (Class Diplopoda), of which the larger species may also eat dead animal matter at times, have two. 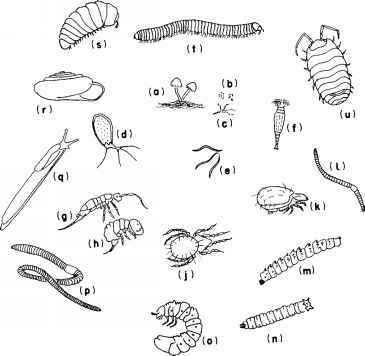 A good modern account of millipedes, which are divided into five major groups, is provided by Hopkin (2004). These animals are common and widespread, being found in leaf litter, rotting wood, and under bark in woodlands. Their common diet of dead plant material and fungi assists decomposition and the return of essential nutrients to the soil, though they may occasionally damage garden crops or plants. Millipedes in the soils of temperate countries are of moderate size, the pill millipede (Glomeris marginata) rolling into a ball the size of a pea. This species is very widely distributed throughout the British Isles and is a significant contributor to decomposition in deciduous woodlands, consuming 10% of its body weight in dead plant material per day and greatly enhancing the bacterial content of the remaining faeces. 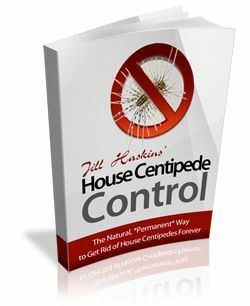 All millipedes secrete repellent chemicals; some tropical forms reach 30 cm and should not be handled, as the chemicals they exude can cause human skin to shed leaving an open wound. Fossil remains of these animals have not been discovered but those of their tracks have, the most famous being that of the Devonian Arthropleura, whose tracks suggest it reached a length of 1.8 m.
Waterlogged and anaerobic conditions prevent decomposition and lead to peat formation and ultimately coal. Acidic forest soils tend to have a build-up of organic matter on the surface (mor humus) caused by the absence of earthworms below pH 4.8 and reduction in fungal and bacterial activity. 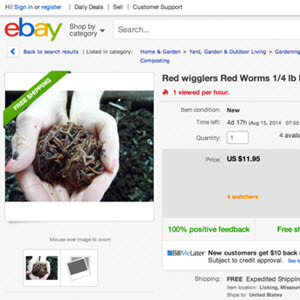 Earthworms are instrumental in processing large quantities of dead material and making it available to microbes (see Sections 2.2.2 and 7.2.1). Although forest ecosystems repeatedly cycle the vital nutrients, they are not entirely self-sufficient. Nutrients leak in and out of the forest when litter is blown around, and when forest fires cause nutrients in smoke and ash to be deposited elsewhere. Stream water often carries nutrients out of woodlands, while rain brings in new supplies. Ecosystems are not hermetically sealed. What are all the subsystems of a oak tree? Where is the woodland hares ecosystem? What are woodland animals are in the food chain?